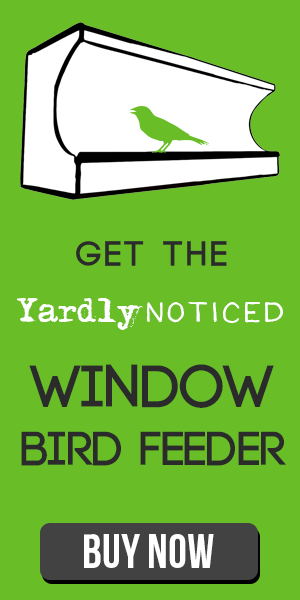 Thank you very much for choosing the Yardly Noticed window bird feeder! We have specifically designed this feeder to install in seconds. In the video below, we show you how easy it can be to install our American made window bird feeder. In just a few simple steps you will have your new window bird feeder mounted and ready to attract all types of birds around your home or office. Step 4: Position the birdfeeder and press down firmly to secure the suction cups to the window. Step 5: Gently push down on the window bird feeder so it locks into place. Step 6: Fill your new bird feeder with seed. It can hold up to 2lbs of seed. Step 7: Wait for the birds to arrive! It can take anywhere from a few hours to several weeks depending on many factors. Visit our website for tips on attracting birds to your new feeder.